Nuat Thai Makati Avenue is one of the nicest and more affordable Spas in the metro. People of all sorts and nationalities frequent this branch, and their calming interiors and polite staff do not disappoint. Nuat Thai Makati Ave hours: 10AM to 3AM. You can walk-in and choose a service, but advisable to make reservations during weekends. The receiving area is quite big and bare, with just enough air of classic spa-ambiance. Couch seats on both ends for waiting clients. After choosing your service, attendants will come with white plastic slippers. Hallway leading to individual mini-rooms for body massage, with curtain partitions. Before any service, feet are washed. This area only accommodates 2 at a time, but the wait is never long. Water from faucet is heated so no cold shock whatsoever. Individual reclining chairs and curtain separator for privacy. Red digital clocks each to keep time. I always look for Nuat Thai wherever I happen to be in the country, just in case they have a branch. And they usually do. The massage itself depends on the masseuse. By standard, it's good. Sometimes you would get someone not too focused or slacking on the pressure, but mostly they do decent massage. I always avail Foot Massage and have never tried Body Massage in any Nuat Thai branches. 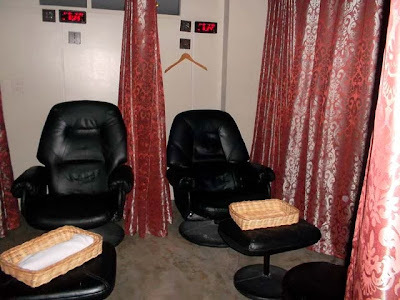 I prefer The Spa or Island Spa for body massage, mainly for privacy and because they offer more services and facilities. Do you have other phone number that I could contact you? I've been calling but line was busy.